Many agents are turned off or are scared off by buyers who are really specific in their home needs. Often selling a house is the opposite, most buyers don’t know what they want. However sometimes you get that one buyer that wants what they want. Many new agents get shut out before they even start. 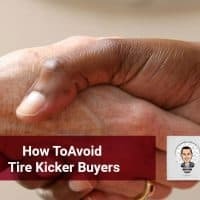 On today’s episode I’ll tell you how to avoid a “Tire kicker,” and stop wasting both their time and yours. Why you need to establish a rapport, trust, and authority with the client. Why you need to have an introductory meeting. The 7 points of conversation for a sale. Why you need to be well educated about the home..
My parents have had their home on the market for several months so I think I’ll have to share this article with them. They’re working with a real estate agent but I think this guide for buyers may be able to help them out as well. I think this will better help them to understand their buyers and what their real estate agent does and hopefully help them with selling their home. Awesome hope it helps them. Thanks for sharing John!